Movies right made by one of America's leading film-makers, Frank Capra. He made "It's a Wonderful Life", which you can see on MJoTA Friday Night movie click here. The Frank Capra movies below are a successful attempt to convince America to fight against German and Japanese aggression during WWII. In no way do I show these to glorify war or say war is a good idea. War results when too many good people are not paying attention. For stories on Black veterans in American wars, click here. Today is 72 years since Ruth, the daughter of a German Jewish chemist and a German Catholic hotelier, gave birth to a boy in the middle of Germany in the middle of the Second World War in the middle of the Jewish genocide. Happy birthday Lothar. I remember walking through the streets of Freiburg-im-Breisgau thinking that the giver of life is the taker of life; and that to God, death is not a tragedy. 74 years ago today, a "half-Jew" gave birth to my husband, father of my younger 2, in Wiesbaden. He now sits in a chair & shakes, imprisoned by a "guardian". Olympic reserve rower, inventor with 57 patents: I am fighting to get him free. The "guardian" does not allow family phone calls, packages, visits: breaking all rules in the Geneva Convention. In 2013 and 2014, I was trying to find him, contacting his tax lawyer, his place of work for 40 years, his doctor, the German Embassy, local hospitals. No response. My daughter and I went to Germany in Aug 2014 to find him, we were about to start checking graveyards when we went to the police to first file a missing person report. The police told us he was alive, and I am his wife. We followed their leads and found Lothar in a lovely nursing home, surrounded by kind people. We were there less than 1 hour when a loud large woman burst into the room, told us it was the last time we would ever see Lothar, because she will not, would not give permission. She is a bridge enthusiast Sylvia Maurer-Ilgen, a former mathematics teacher, for a decade or so his next-door neighbor, and later his land lady. She spends a great many days of the year driving in Lothar's cars to bridge competitions around the Black Forest, and at least once a year, to other parts of Germany. The hospital personel told us she shows up occasionally once a week but often less frequently, and screams at him for 30 minutes before driving away in his cars. Today is May Day, 2012. In the United States, National Asthma Day. I have gathered some articles on asthma. In the United States, asthma disproportionately affects children of African ancestry. Is it a poverty issue, a genetic issue, both? Articles have been produced claiming both. The fact is, if your child can't breathe in the middle of the night, you really don't care. What can you do to lessen the frequency of asthma attacks? Keep your house obsessively clean. no dust, no curtains, no carpets, books behind glass, get rid of anything that will attract cockroaches. To read more from the NIH, click here, data from the CDC published by the Office of Minority Health, click here and about how household intervention can help children with asthma, click here. May is the month of continuing miracles. All is green, flowers are continuing to bloom, tomato plants are finally looking like tomatoes will be produced. May is the month America gets impatient with summer starting in June. "Damn it", I hear echoing through the centuries, "end of June? You have got to be kidding, my summer is starting at the end of May, Memorial Day." Hey, that works for me, and for my town, my swim-club opens its doors at the end of May. I have paid the annual fee, oiled my bicycle, made sure my tennis racket and basketball hands are in working order. That is May Day for me now. A long time ago, in Germany, in 1941, when the German government had an official policy of equating Jews with vermin, a young Jewish woman gave birth to a boy on May Day. Because of miracles that happen when people pay attention, the young woman survived the war, and the boy grew up to become a prolific inventor. Later than most men, he became the father of a boy and a girl. I have the great privilege of being their mother. Happy 71st birthday Lothar. 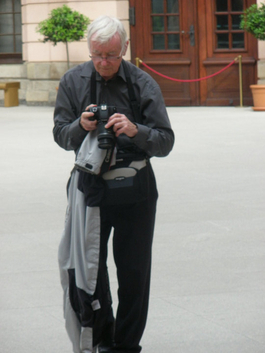 Listen to the story of Lothar's mother, Ruth, click here, or click on the picture of Lothar above, the man with thick white hair fiddling with a camera. May 1, 1941. Citizen Kane was first shown in New York. That is the good news. Two British ocean liners were sunk, General Rommel invaded Tobruk, and the citizens in Liverpool awoke to devastation, the German Air Force (Luftwaffe) had started dropping bombs, and continued for the next 6 nights. The head of the Luftwaffe, Hermann Goering, was also second in command of the Nazi empire, on May 1, 1941, he signed a law called Einsatzstab Rosenberg, which was a directive for theft of anything that looked valuable in countries that were occupied by Germany. May 1, 1986. I had met Lothar the previous week, on April 25, on Anzac Day, and the Black Forest spring was intoxicating. In that week I traveled to Essen for 2 days to visit Professor Gerolf Gros and stay with his family. He showed me around Essen, around Albert Speers mansion, and in the evening I drank red wine with him and his wife. The next day, April 30, I had a splitting headache, and I called Lothar from a train station. He told me that I needed to know that red wine that comes from north of Frankfurt should never, ever be consumed. Ah! And in the evening we partook in the German ritual of eating spargel - freshly harvested white asparagus. May 1 is a holiday in Germany, and Lothar held a party. A lovely party, filled with keen skiiers who saw Spring as a necessary evil between decent snowfalls. A lot of the discussion was about Chernobyl, because during that week the nuclear reactor had malfunctioned, and started spewing out radioactivity, some of it eventually landed on Germany. I was going back to Philadelphia the next day for a week after 2 months in Freiburg, and would return for a conference in Titiisee, high in the Black Forest. I remember 2 party members rather liking each other's company after the wife of one of them left the party; and Lothar staying up all night talking to them to prevent them connecting intimately in his house. In the morning, Lothar piled me and my luggage into his Audi and drove me with the couple to the train station. He walked with me into the train, and as I looked out of the window and waved him goodbye, I saw the couple connecting inappropriately against a wall. Well, not in his house. I returned to Freiburg a week later, and many more times over the next 12 years. Lothar was so strong, so principled, so competent. 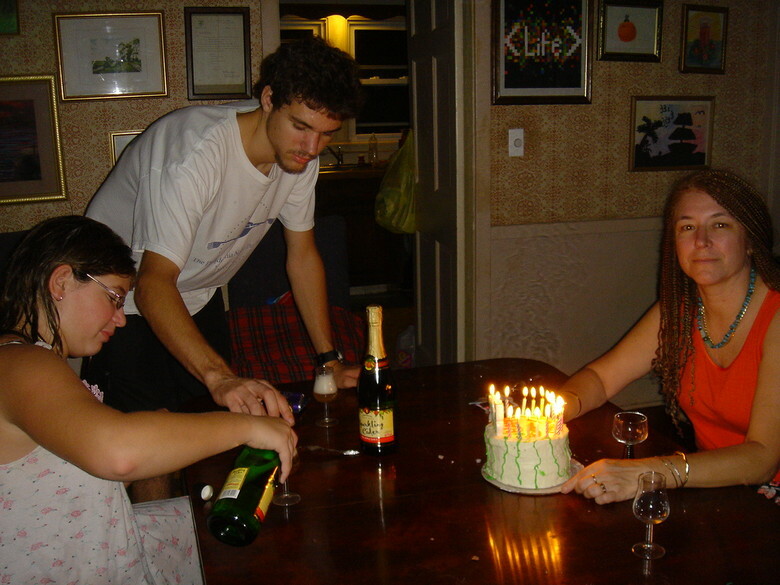 Below, my 56th birthday with our 2 children in 2007.